Compare prices and find affordable car hire in Los Angeles Airport. We search among multiple suppliers to find the cheapest prices. Unlimited mileage, the necessary insurance and tax are included in the rate given. The Los Angeles International Airport (LAX), which is often just referred to by its IATA code, is the primary airport for the greater Los Angeles region in California. It is located just 16 miles outside of downtown Los Angeles. The Los Angeles International Airport in 2010 was ranked as the sixth busiest airport around the globe, handling approximately 58,915,100 passengers. In 2009, it was listed as the fifth busiest in terms of take-offs and landings with 634,383 traffic movements. LAX is the busiest airport in California in regards to air cargo activity, passenger traffic, as well as flight operations. LAX also handles more destination and origin (not connecting) passengers than any other airport around the world. Just a few of the main airports that fly to and from the Los Angeles International Airport includes Air Berlin, Air Canada, AirTran Airways, Alitalia, American Airlines, British Airways, Delta Airlines, El Al, Iberia, JetBlue Airways, KLM, Lufthansa, Qantas, Southwest Airlines, United Airlines, and WestJet. The top five busiest international routes in 2010 were London, United Kingdom; Tokyo, Japan; Sydney, Australia; Taipei, Taiwan; and Seoul, South Korea. 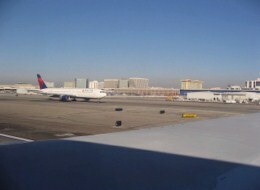 The top five busiest domestic routes in the same year were San Francisco, California; New York, New York; Chicago, Illinois; Las Vegas, Nevada; and Dallas / Fort Worth, Texas. Once inside the Los Angeles Airport, there are quite a few amenities that travelers may be interested in. These amenities include tourist information, car rental kiosks, shopping boutiques and restaurants, and ATM machines to withdraw money for the trip. Carhireusa.org compares car hire prices in most destinations in the US. The booking engine compares both local and international suppliers.